I’m a firm believer that most things are better on toast: salads, roast veggies, you name it. Put it on toast, and it’s automatically a more satisfying meal or snack…right?! Of course, this philosophy depends on the bread. The bread’s got to be good…good tasting and nutritious. This toast recipe is built on Silver Hills Sprouted Grain Bread which, because of the sprouting process, is more easily digested than other breads. The grains have been soaked in water to unlock nutrients and to make them readily available for our bodies. Sprouted bread is a healthy alternative to both white and whole grain bread. Silver HIlls Sprouted Bakery makes a dozen types of sprouted breads, including Squirrelly Bread (high in fibre), Mack’s Flax Bread (low in sugar) and Little Big Bread (low in fat). They’ve got a bread option for every dietary preference, including sprouted grain bagels and burger buns. When I learned more about Silver Hills, I was so thrilled to learn that this local, family-owned and run company is also 100% plant-based!!! Every recipe they share is vegan. They are a kind, compassionate and healthy family! Dry your chickpeas (let them air dry or use a tea towel to pat them dry) and place in a medium sized bowl. Add all spices and oil, then toss. If you’re low on spices, just stick with salt and pepper — they’ll still be great! Transfer chickpeas to your baking sheet and roast for 40 minutes. Every ten minutes, jiggle the pan so all sides of the chickpeas are roasted. 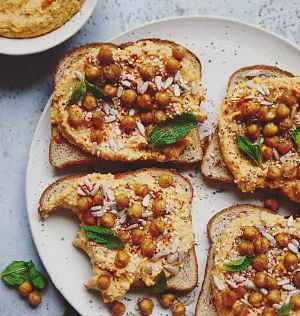 Toast your Silver Hills bread and load heavily with hummus. 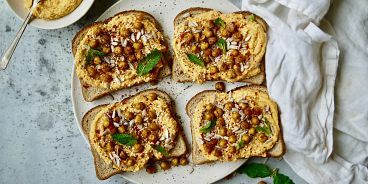 Garnish with crispy chickpeas, sesame seeds, pumpkin seeds, fresh mint, salt and pepper. Thank you to Silver Hills for sponsoring this post! All opinions are my own.